The completely redesigned 2018 Honda Accord has been racking up the awards since being introduced to the market last year. Indeed, this 10th-generation Accord which has been completely redesigned from the ground up won the prestigious North American Car of the Year title last month, and now it has just been named the Canadian Car of the Year for 2018 by the Automotive Journalists Association of Canada. The Canadian Car of the Year award is the most prestigious award a new vehicle can receive in Canada. It is handed out by the Automotive Journalists Association of Canada after a series of intense testing where new vehicles are compared back-to-back in identical conditions to ensure accurate testing. Vehicles are evaluated according to a set of criteria that range from fuel economy to power, driving pleasure, interior space, connectivity and safety technologies, style, and overall quality. The results are then compiled by KPMG and the winner is announced at the Canadian International Auto Show in Toronto in February. 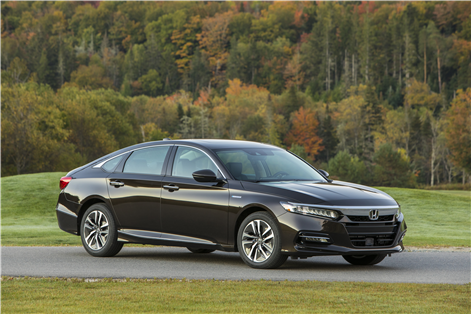 The 2018 Honda Accord was completely redesigned this year with a host of improvements. Two new fuel-efficient turbocharged engines handle power while a new, more spacious cabin is now the norm in the 2018 Accord. Moreover, the Accord features the most impressive list of standard equipment of any vehicle in its segment with features like adaptive cruise control, lane departure warning and prevention, and automatic braking with collision detection coming standard in the brand new 2018 Honda Accord. To learn more about the new 2018 Honda Accord, contact us today at Halton Honda!